(Portland, Oregon) – The bumper stickers say “Keep Portland Weird” (although that declaration of strangeness is likely overstated by this city’s denizens). The whole state often gets tagged is having a lot of rugged individualism, along with the thumps it gets for its decidedly left-leaning politics. Oregon is also known for its wild beauty – and rightly so. And tourists flock here for its coastline and mountains. So there's no surprise that this state is full of surprises in its attractions. The oddities, kooky places and wacky stuff abound in Oregon – side by side with its breathtaking natural features. Here’s three of them, with some information about a fourth on the way. Portland's Old Town/ChinaTown. It’s a mix of majestic Asian structures and strip clubs trying their darnedest to be upscale, along with kooky features to gawk at, atmospheric, elderly architecture that’s impressive and yet a sizable population of homeless folk that tug at your heartstrings. Portland's Church of Elvis - a "cacophonous conglomeration of, well, crap"
Only tourists and those really new to town stop to click pics with reckless abandon and then, most likely, disappointed curiosity. In the end, it’s hard to say what this wacky exhibit is all about. It’s really just a visually cacophonous conglomeration of, well, crap. The famed Hung Far Low sign - insert joke here. For a better time, and a quirkier one, continue on through Old Town and keep your eyes open. Numerous other landmarks provide a goofier, more humorous time, often inadvertently so – which, let’s face it, is the best kind. Like the direct but awkwardly named “Good Taste Restaurant,” an Asian cuisine establishment. The fact that Couch Street is pronounced "cooch" and that it hosts a bundle of strip clubs is good for about a dozen jokes and puns that can’t be repeated here, but they write themselves with remarkable ease. 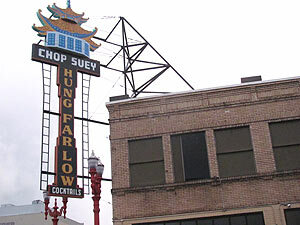 Then there’s the famed “Hung Far Low” sign, the massive construct that once heralded a Chinese restaurant and bar that was around for decades, having shut down only fairly recently. This ultra-humorous calling card was actually rescued from demise in 2010. Oregon Vortex, Southern Oregon. This southern Oregon landmark is part kitsch and part wow, and it’s become a famed Oregon tourism staple. It’s also hard to tell what’s going on here, as some claim it’s all done with a kind of magician’s skill of illusion, and others maintain it’s the real deal. Essentially, there’s purportedly a kind of gravity anomaly here that causes you to “lean” or point in an unnatural manner, as if gravity is a bit off here and you don’t stand in the usual way: evenly pointed away from the Earth. You walk around at an angle. Also, you may appear taller or shorter, depending on where you stand in relation to magnetic south and magnetic north. It’s been around since the 30’s, and stands on the site of an old west-like structure that’s bent at all sorts of strange angles. Ghost Forests of the Coast. Along the rather mysterious stretch of Highway 101 between Lincoln City and Pacific City, there’s a little village called Neskowin with a big, strikingly strange secret. 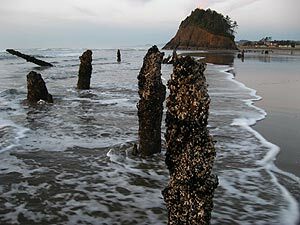 A ways beyond the bulb-like rock structure near the main beach entrance, you’ll see a bundle of short, dark structures sitting at the tide line that look a bit like old pilings left over from a pier. They are in fact trees some 2,000 years old, called a “ghost forest” for their eerie appearance (and their rather eerie and ominous history). 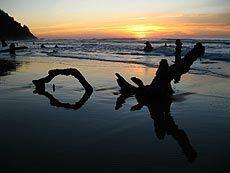 The main theory is that the landscape here changed rather abruptly – in geologic terms – causing this strand of trees to be choked off by sand, mud or tide, over a handful of decades. This killed them, but as they were buried in this material, they were cut off from oxygen, thus preserving them. Eventually, late in the last century, sand levels dropped again, revealing them once more. They create a variety of strange shapes next to the waves. Not all of them stick straight up. Some lay at odd angles, twisting and turning in and out of the sand. One has an enormous hole in it and looks a little like a craggy, eccentric hot tub. There are actually several more locations where more ghost forests show up on the coast - and older ones. The ones at Neskowin are visible throughout most or all of the year, whereas the others, often 4,000 years old, only show up during winters when there are extreme low tide events. For more on the ghost forests. Odd Attraction Coming Soon: A 747 Waterslide. At McMinnville’s famed Evergreen Aviation & Space Museum, there’s already a roadside oddity sitting atop this gargantuan structure: a Boeing 747 that’s partially gutted, showing its insides. This will soon, believe it nor not, become part of a 50,000-square-foot water park. People will board this jetliner destined for a very wet place as they’ll hurl themselves down a massive waterslide into the a pool below. It’s already the home to Howard Hughes' legendary "Spruce Goose" aircraft, a Titan missile and dozens of other awe-inspiring features. Many of these are visible from the highway and cause no shortage of gawking. But add to that the rather random sight of a jumbo jet atop the building – and the knowledge of what it will become – and you’ve got some giggles along with the wonder. 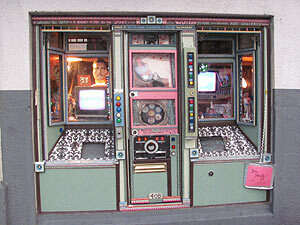 500 N.E. Captain Michael King Smith Way, McMinnville. 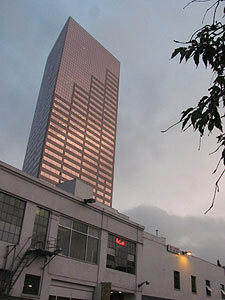 503-434-4180. www.sprucegoose.org.